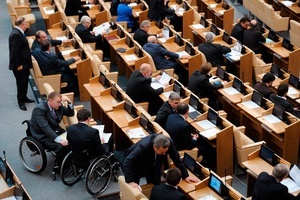 The Federation Council, Russia’s upper chamber of the Duma, Wednesday passed amendments to the law on treason that could make it possible for law enforcement officials to target people collaborating with international organizations. The changes, which were passed by the State Duma earlier this month, were approved by 138 of 166 of the Federation Council’s senators, despite appeals from the human rights community to put them on hold. The amendments were pushed by Russia’s Federal Security Service, or FSB, which unsuccessfully attempted to force through similar changes in 2008 while Dmitry Medvedev was president. To become law, the amendments now have to be signed by President Vladimir Putin, which he is widely expected to do soon. When the law does come into force, it is expected to be one of the most devastating blows against Russian civil society since the Duma passed new amendments to the Russian law on NGOs, which require nonprofits receiving funding from foreign sources to register as “foreign agents” with Russia’s Justice Ministry. On Thursday, Russia’s new internet restrictions also went into effect, eliciting ire from international press rights groups. Many rights activists, including Alexander Nikitin, chairman of the Environmental Rights Center (ERC) Bellona, say the “foreign agents” moniker will marginalize civil society organizations in the eyes of Russian’s as spy rings and burden them with undue political connotations that will cause the foreign funders many of them depend on to balk. The new amendments to the NGO law take effect on November 20. The expanded definition of treason includes divulging a state secret or “providing consulting or other work to a foreign state or international organization” if an organization works against Russian security interests – something renowned human rights lawyer Yury Schmidt, who sits on ERC Bellona’s board of directors, says lends itself to such broad interpretation that any Russian citizen speaking to a foreigner is in danger of being branded a spy. The previous version of the same law referred only to “foreign organizations” and not to international ones, Schmidt noted. Under the new law, traitors can be punished by up to 20 years in prison. The legislation was voted through the Duma’s lower house 375 votes to two on October 23, despite vociferous outcry from Mikhail Fedotov, head of the Presidential Council on the Development of Civil Society and Human Rights, and other members of Russia’s human rights community, which has taken a battering since Putin’s third term inauguration on May 4. Schmidt noted in a recent interview that, “legislators have been passing laws dedicated exclusively to the curtailing of the domain of civil liberties” since Putin returned to office. The expansion of treason’s definition has alarmed activists who work with groups such as the Organization for Security and Cooperation in Europe, or OSCE, Amnesty International and Human Rights Watch. The amendments are seen as part of a Kremlin crackdown on human rights activists, who Putin has accused of pushing the agenda of Western governments – a criticism born when hundreds of thousands of people took to Moscow streets to protest December’s rigged Duma election and Putin’s return to power. Ironically, other supporters of the new law on treason say it brings Russian law into closer accord with US treason and espionage statutes. Igor Korotchenko, a national security analyst and chairman of the public advisory council to Russia’s Ministry of Defense told Washington-based National Public Radio that he highly respects the work of the US Federal Bureau of Investigation and its success in rooting out Russian spies like Robert Hanson and Anna Chapman. These achievements, said Korotchenko, are the result of broadened powers given the FBI in the wake of the 9/11 attacks, and he wishes to see Russia’s Federal Security Service, or FSB, endowed with the same broad powers. The praise echoes insistence from the Duma’s Kremlin lapdog United Russia party, which authored the new NGO law amendments, saying the changes merely reflected US’s 1938 Foreign Agent Registration Act – which was primarily adopted to countermand Nazi activity in America prior to World War II. ERC Bellona board member Schmidt called out such comparisons as blatantly misleading. Other critics noted that it’s not the powers but the lack of specifics that make the new law dangerous. “The interesting thing about this law is that you don’t need to actually implement it or have people arrested because of the new law. You just need to pass the law and people will be more cautious,” said Andrei Soldatov, the editor of Agentura, an online Russian secret services watchdog journal. Soldatov says he’s already seen his colleagues — security experts and Russian journalists — becoming more cautious about speaking with or making contacts with foreigners. Despite the fact that the new NGO amendments do not take force until the end of this month, its effects have already been made evident by the October 1 closure of the Moscow office of the United States Agency for International Development (USAID). The agency supported dozens of Russian NGOs, among them Golos, the vote monitoring body that exposed December’s parliamentary election fraud. In early September, the Mari El Region 850 kilometers east of Moscow, issued a directive to members of its local government to refrain from participating in social or political activities organized by foreign nongovernmental organizations or Russian NGOs receiving funding form foreign sources. On Thursday, another law clamping down on the Russian internet – which was forced through with July’s passage of the NGO amendments – also took effect. The law’s framers say it is meant to target websites harmful to children—but also aims at sites deemed extremist. Critics have accused the government of creating a tool that could shut down opposition websites and create a climate of widespread censorship in Russia. International press freedom watchdog Reporters Without Borders said the Kremlin will likely misuse the law. “We are forced to conclude that no political will exists to resolve the law’s contradictions and to eliminate those that pose threats to freedom, despite criticism of the law from many quarters,” the group said in a statement. The group said that Russia is flailing to redefine the meaning of treason and is looking to increase penalties for blasphemy convictions. “Taken as a whole, the latest legislative initiatives in the Duma all the appearance of a concerted attack on freedom to disseminate information,” it said.